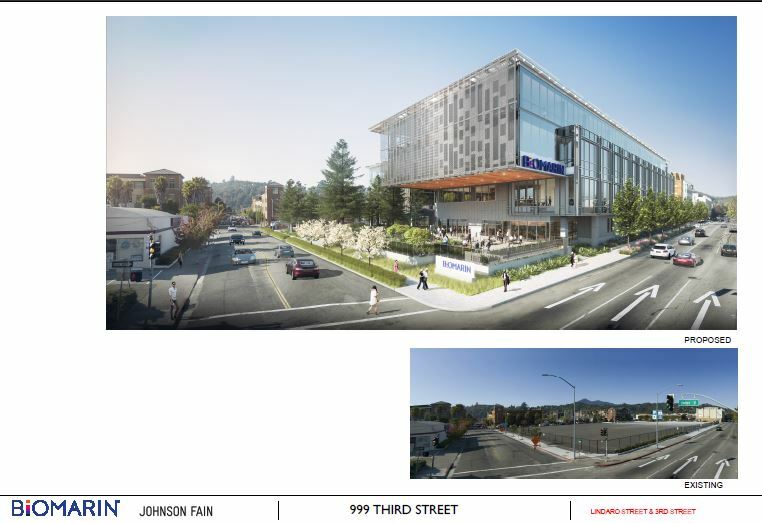 BioMarin, in conjunction with Whistlestop/Eden Housing, submitted a planning application for a proposed development on 999 3rd Street in downtown San Rafael. The project site, between 2nd and 3rd Streets (at the corner of Lindaro), is approximately 133,000 square feet in size. The property owner, BioMarin, proposes to construct two, four-story 69’ tall buildings for the purposes of laboratory/R&D and general office spaces. A third building, a six-story senior center / senor housing development, would be constructed by Whistlestop/Eden Housing on a 15,000 sq ft portion of the property at the corner of Brooks and 3rd Street. BioMarin’s buildings would each be four stories but with large floor to ceiling heights to accommodate infrastructure and facilities for their laboratory/research & development needs. The proposed components of the project are not covered by the 1998 San Rafael Corporate Center (SRCC) master plan approvals (per PD 1936). The formal application requires review and approval by the Design Review Board and the Planning Commission and ultimate approval by the City Council for in order to proceed. Expansion of the existing Planned Development (PD) zoning designation that applies to the SRCC to encompass the 999 3rd Street property. General Plan Amendments to: 1) modify the maximum intensity of nonresidential development and assigned floor area ratios (FARs), reducing the FAR of the 999 3rd Street site from 1.5 to 0.9 and increasing the FAR of the SRCC to 0.9, with 0.9 as a blended ratio across the expanded PD; 2) allow for the use of blended FAR for Downtown PDs under single ownership or unified control, consistent with current General Plan Policy LU-9.b.2 which allows for a transfer of FAR among Downtown project sites; and 3) establish a height bonus for the 999 3rd Street site in exchange for BioMarin providing specified amenities and community benefits. The BioMarin portion of the project is requesting a 16’ to 20’ height bonus as a requirement to facilitate the four-story laboratory floorplates of 17’. Per the SRMC Section 14.160.190 (A)(3) the project would be allowed a maximum height bonus of 12’ contingent on providing affordable housing, public parking, or skywalks over 2nd/3rd street. In 1998, the SRCC campus plan was approved with a height bonus of 24’ (54’ to 78’) based on concessions as required by the San Rafael Municipal Code Section 14.160.190(A)(2) for development in the Lindaro Office district. Height bonus provided in exchange for public benefits in the 2/3 MOU pursuant to Section 14.16.190 of the Zoning Ordinance (discussed below). Approval of parking ratios appropriate to the proposed uses, considering the overall needs of the SRCC and the effectiveness of BioMarin’s Transportation Demand Management (TDM) Program, which would be expanded to apply to the entire BioMarin campus in San Rafael, including the 999 3rd Street site. BioMarin’s application also includes a contingency plan that addresses future scenarios in case of a change in tenancy or ownership that results in a greater parking demand than assumed for this project. Donation of funds to enhance pedestrian safety with improved sidewalks and crosswalk design at the corner of Lindaro and 2nd streets, as well as 3rd Street and Lootens Place. 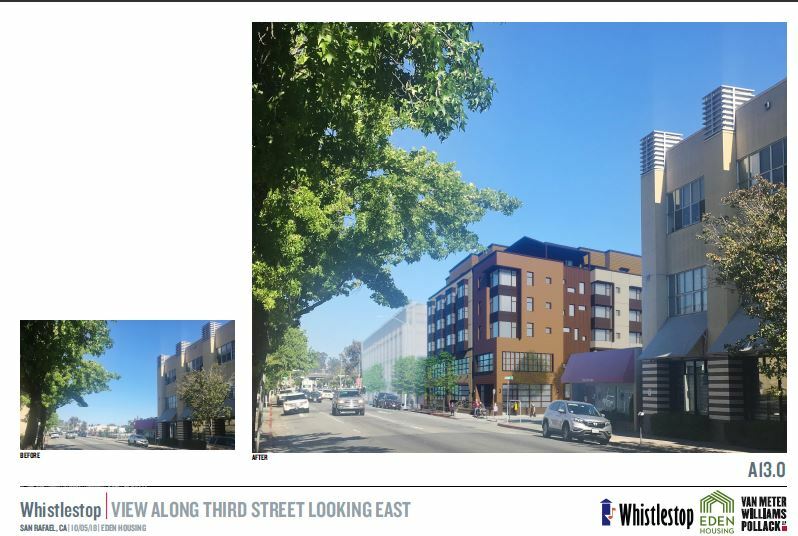 Approval of a mixed-use building for Whistlestop/Eden Housing with additional residential density and height, and reduced landscaping and parking via application of the State’s Density Bonus Law and in accordance with Section 14.16.190 of the City’s Zoning Ordinance. The Whistlestop portion of the project would include a requested 16-ft height bonus as a concession under the State Density Bonus law and under the City’s density bonus provisions and is considered a minor concession. Minor concessions are granted if a project provides the required affordability and the concession does not require the submittal of a financial pro forma by the applicant. The project’s planning entitlements would typically require Planning Commission review and approval, based on the recommendations of the Design Review Board (Board). Currently, the application is being reviewed by various City of San Rafael departments (Building, Fire, Public Works) for completeness and consistency with the San Rafael Municipal Code. Concurrently, the City of San Rafael has contracted with Amy Skewes-Cox to prepare an Environmental Impact Report (EIR) pursuant to the California Environmental Quality Act (CEQA). The EIR will evaluate potential project impacts for areas of environmental concern such as, visual impacts, traffic and circulation, air quality, noise, greenhouse gas emissions, hydrology and drainage, and hazardous materials. A scoping meeting to receive agency and public input regarding the EIR will be conducted in late 2018. The Draft EIR is anticipated to be ready for public review in the first quarter of 2019.